After 10 generations of experience, engineering innovation and refinement, the Honda Accord has reached another pinnacle. New from the ground up for 2018 the Accord has a more rigid and lighter unibody platform; it?s lower and wider; and for first time it has a turbocharged engine plus an available 10-speed automatic transmission. The improvements have earned the new Accord the coveted 2018 North American Car of the Year designation. 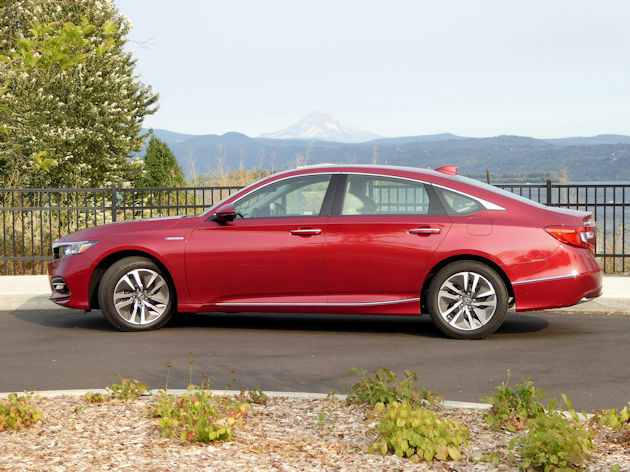 With its athletic lines and European-inspired coupe-like roofline Accord looks more like one of the $50,000 to $60,000 luxury sedans than a car with a starting price of less than $25,000. But as great as the new Accord is, its latest variation, the Hybrid, is likely to have a great appeal to frugal mid-size sedan buyers. 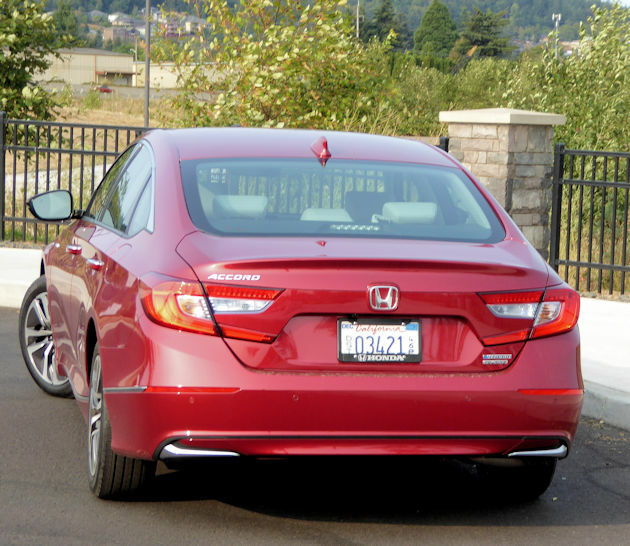 We recently drove the Accord 2.0T with the 10-speed automatic transmission ? 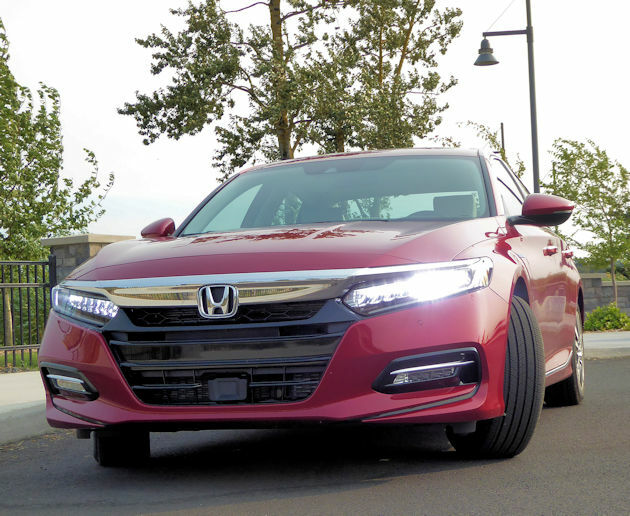 See our review at https://ourautoexpert.com/2018-honda-accord-test-drive/. It?s a quick midsize sedan, making a 0 to 60 mph acceleration run in 5.7 seconds according to the tests run by buff magazines. With its quick revving turbocharged engine it was fun to drive, comfortable to ride in and quite spacious. The fuel economy is a respectable 22 mpg city, 32 mpg highway and 26 mpg combined. The Hybrid makes the 0-60 mph run in 6.7 seconds, which is good for a mid-size hybrid but it gets a whopping 47 mpg, according to EPA estimates, and we averaged just under that number during our week behind the wheel. The Hybrid doesn?t have quite the same athleticism of the touring model, but we think the ride is more comfortable. The Accord Hybrid is powered by Honda?s innovative third generation two-motor hybrid powertrain. It mates a 2.0-liter DOHC i-VTEC Atkinson-cycle four-cylinder engine with two electric motors to produce a class-leading total system output of 212 horsepower. Unlike most hybrids, the Accord is direct drive and uses no transmission at all, but it sometimes feels like a continuously variable transmission. A steering wheel-mounted Deceleration Selectors allows the driver to maximize energy generation by toggling between four levels of regenerative braking performance. The right selector increases regenerative braking and the left selector reduces regenerative braking. The system simultaneously helps reduce stress on the brakes while increasing battery charging via regeneration. 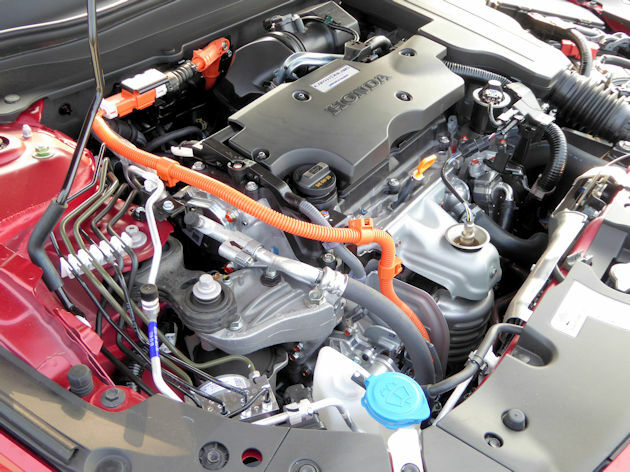 The Accord Hybrid?s powertrain operates by seamlessly shifting between three distinct drive operations: EV Drive (100-percent electric motor), Hybrid Drive (electric motor and gasoline engine [driving the generator motor]) and Engine Drive (gasoline engine), utilizing power from the gasoline engine and electric motors to accommodate the current driving conditions. 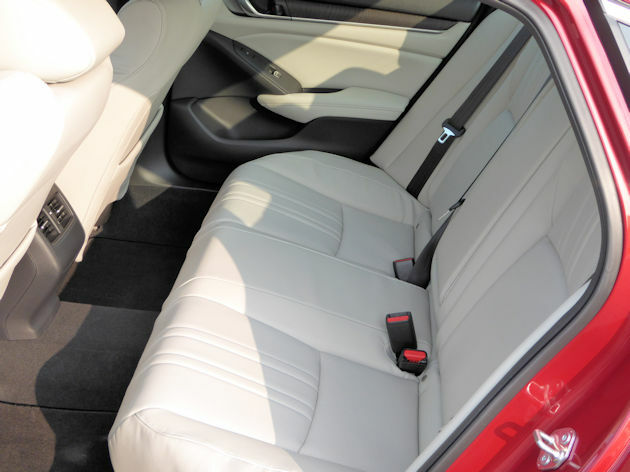 The interior is attractive and spacious with comfortable seating front and rear. 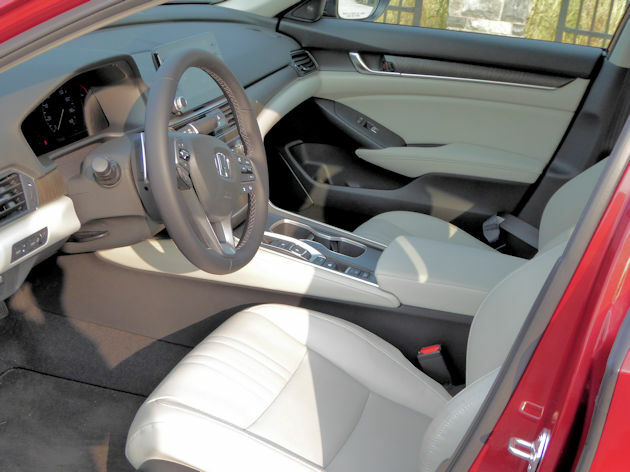 The well thought out interior has controls precisely placed for ease of use, and Honda has addressed some of the features we missed in the previous generation. The most significant being having trouble operating the touch controls on the audio system before, but this new one has knobs for volume and tuning that make it much easier to control. A large infotainment screen is mounted at the top of the center stack, just below windshield in a perfect position. It requires only a sideways glance from the road to see and is within easy reach when the driver or passenger wants to make changes. On either side of the screen are real buttons used to activate infotainment and navigation functions making access easier and more direct. Mounted lower on the stack are the easy-to-use knobs and buttons of the climate control system. The parking brake is a convenient electronic unit requiring a simple touch to activate and the transmission-like control is Honda?s unique push button system with every button being different, so the driver can identify each control without looking. 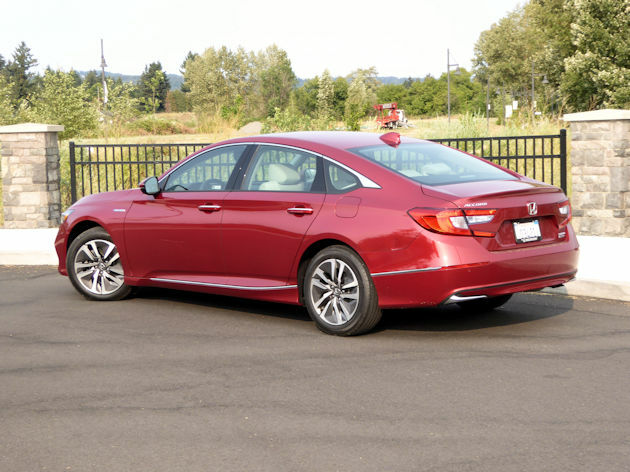 The 2019 Honda Accord Hybrid is available in four Hybrid trim levels: Hybrid, EX, EX-L and Touring. Pricing ranges from $25,990, including the destination charge, for the Accord Hybrid E-CVT and top out at $35,600 for the Hybrid Touring version. These prices are about $4,000 less than the previous generation Accord Hybrid prices but includes extensive standard equipment like LED headlights and taillights, Smart entry with Push-button Start, a 7-inch TFT digital driver?s meter and a multi-angle rearview camera. 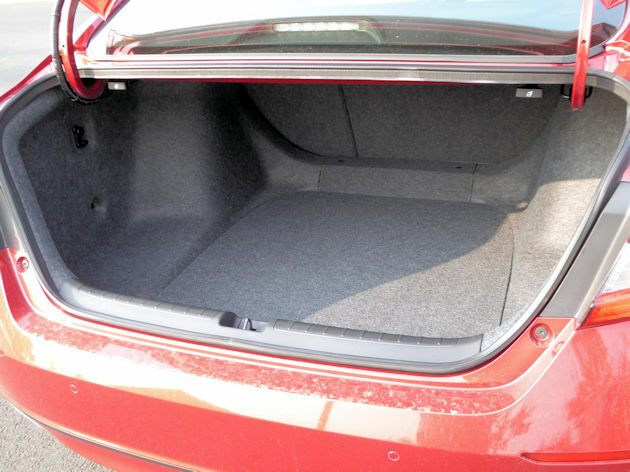 All Accords have standard Honda Sensing? which includes Collision Mitigation Braking System?, Lane Departure Warning, Road Departure Mitigation, Adaptive Cruise Control with Low-Speed Follow and Traffic Sign Recognition. Honda Sensing also includes Blind Spot Information, front and rear parking sensors, Rear Cross Traffic Monitor and Driver Awareness Monitor, and a Multi-Angle Rearview Camera with dynamic guidelines. The Honda Accord Hybrid is an excellent choice for someone thinking of making a move to a hybrid. It?s well built, comfortable and who can argue with 47 mpg. Now if they would only offer an all-wheel drive version it would be high on our shopping list.